Grace Under Pressure by Julie Hyzy, a Mysterious Review. 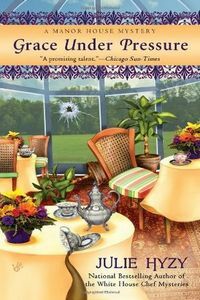 Review: Grace Wheaton, assistant curator for the Marshfield Manor, must step up and take charge when her boss is murdered in an apparent case of mistaken identity, in Grace Under Pressure, the first in a new cozy series by Julie Hyzy. Bennett Marshfield, owner of the mansion/museum, has been receiving threatening letters from a blackmailer demanding payment of $5 million. Another such letter has arrived and Abe, the manor's curator and Bennett's long-time friend, wants to meet him in his study to discuss it. But before Bennett can do so, a shot is heard and Abe is found dead. No one was seen entering or leaving Bennett's quarters on the top floor of the mansion, which are off-limits to visitors and previously considered secure. Grace must quickly assume management of the staff to keep the estate running, but also realizes that, as an insider herself, she may be able to discover and pursue leads that the overworked local police consider too inconsequential to follow. Though a strong, appealing character is introduced in Grace Wheaton, and the setting for the series — no doubt patterned after the Biltmore estate in North Carolina — is magnificent, Grace Under Pressure as a mystery takes far too long to get started. Even though the murder takes place within the first few pages, it's only at the half-way point that Grace slips into amateur sleuth mode. On page 154: "The trail was getting colder by the moment. While I never considered myself an expert, even I knew that the first twenty-four hours after a murder were the most crucial. We were well past that time frame now." And a few paragraphs later: "I rubbed my forehead. I needed to do something, not just sit here and feel useless." Even then, after which the plot rapidly picks up the pace, the resolution to the murder is weakly played out. While some readers will certainly appreciate the colorfully drawn characters and the many tangential subplots and sidestories in this English village-inspired series debut, those expecting a cleverly devised mystery may be disappointed. Acknowledgment: Kaye Publicity provided a copy of Grace Under Pressure for this review.